Check out my review of the Aqueon Circuation Pump 1250 where I explain how it matches of to the Koralia 1400 for circulated the water column in a 178 gallon planted aquarium. Check out my review of the Hydor Koralia Evolution 1400 where I explain how it matches of to the Aqueon 1250 for circulated the water column in a 178 gallon planted aquarium. Just posted a few images of my planted aquarium 3rd Rock Genesis. It was done in a monster 178 Gallon tank, be sure to check it out! Check it out Here!! Just posted a few images of my planted aquarium that was featured in TFH's "Adventures in Aquascaping." It was a great experience to write a 4 part series for a magazine, but it sure was challenging to come up with some interesting material every month! Oh, I couldn't think of a name, anyone have a good one? Check it out Here!! Check out my new review on the Hydor ETH 300 In-Line Aquarium Heater. I show how this thing works and what things look like after a major meltdown. Hydor ETH 300 In-Line Heater Review. This year the convention was held in Fort Lauderdale, Florida from November 11th through the 14th. The convention is filled with speakers, sponsors, field trips, competition and friends. This year I had the privilege of being asked to present at the convention. Check out my journal of the event!! Check out my 1st of 4 articles in this months (September) issue of Tropical Fish Hobbyist!! Over the next 4 months I am going to set up an ADA 75p from start to finish and explain all the parts that go into creating a successful planted aquarium masterpiece. The EHEIM Professional 3 is a monster of a filter. I am currently using it on a 178 gallon Oceanic planted aquarium. Check out my review of the EHEIM Professional 3. This year, AquaFest was held in Laurel, Maryland. AquaFest is a collaboration between PVAS, GWAPA, and CCA. This was my first time attending AquaFest and I was also going to be speaking at the event. Check out pictures and a journal of the event! I will be giving a talk on planted aquarium photography at the BCAS in Churchville, PA. The event takes place on Thursday January 7th, 2010. Come hang out with me and learn a ton about how to photograph a planted aquarium. Click here to learn more. 10/5/2009 - "Your First Steps to a Successful Planted Aquarium!!" I added a PDF download as an alternative to the Publisher file. You can check them both out here. This year, the Marine & Aquarium Conference of North America was held in Atlantic City, NJ and I decided to visit for a day. Check out my write-up on the day with tons of pictures!! 9/8/2009 - Planted Aquarium Podcast - SFTM - Both parts available!! The podcasts take a high level look at planted aquariums and all the steps to a successful start in the planted aquarium hobby. Starting with understanding where to start, to strategies to remain successful. Be sure to checkout both parts of the Planted Aquarium Podcast on Sounds Fishy to Me!! I will be giving a talk on planted aquarium photography at Aquafest 2009 in Laurel, Maryland. The event takes place the weekend of October 16-18th. Come hang out with me and learn a ton about how to photograph a planted aquarium. Click Here for more information. If you miss these times, check out the achives at http://www.aquaradio.net/pages/podcasts/. It was a ton of fun and I want to thank AquaRadio.net for their time!! I added my latest layout "Black Sand Beaches of Wainapanapa" to the Gallery. This layout was inpspired by my visit to Maui. While in Maui, I visited Wainapanapa State Park along the Road to Hana. NASH (Nature Aquarium Society of Houston) arranged a collection trip to San Marcos River, San Marcos, Texas. The weekend was filled with inspiration, food, and great company! Kirsten Eidsmoe - ADA Aquajournal #159 - Aquascaper in Focus The 2008 AGA Convention in Atlanta, Georgia was a whirlwind of an event. Of all the stories I have told from that weekend, the one of Kirsten Eidsmoe is one of my favorites. As many of you know I took about 1,500 pictures at the 2008 AGA Convention. I was lucky enough to have two of my pictures published in the ADA Aquajournal #159!! 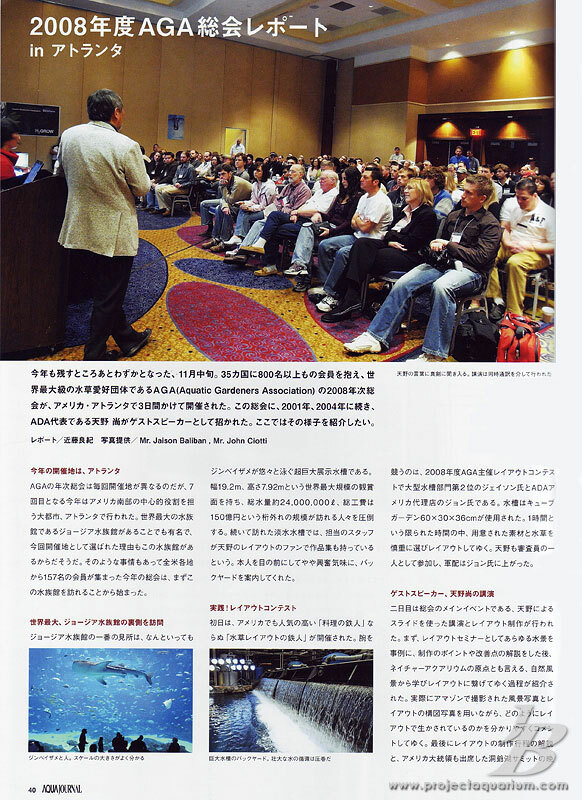 The AJ features a two page spread on the convention. Here are the two pages. Page 1 and Page 2. Here are the two pictures that were published. Picture 1 and Picture 2. 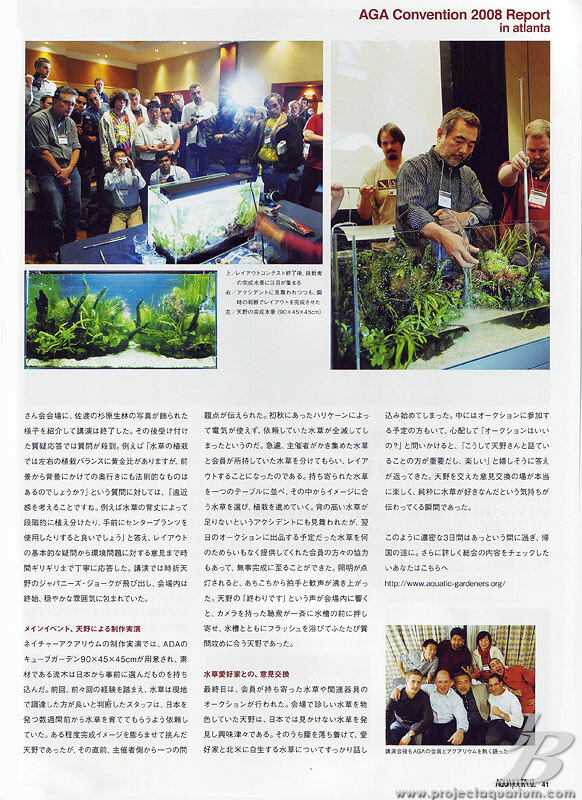 Here is my writeup on the 2008 Aquatic Gardeners Association Convention. 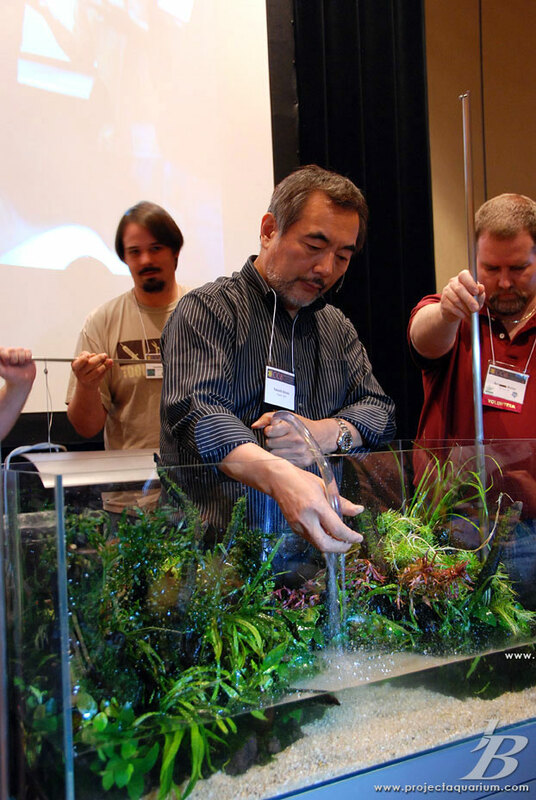 Planted aquarium enthusiasts came from around the world to attend the convention. Here is a brief account of the amazing weekend. I added my latest layout "Hill of Skull" to the Gallery. This one turned out creepy, thus the name. It is a twisted field of simplicity and tension. My "Meander" layout finished with a 105 World Ranking in the 2008 ADA IAPLC. There were 1170 entries from around the world. I finished 3rd among all entrants from the US. I finally got around to writing my comments on the ADA cube gardens. There are a lot of opinions out there on whether ADA’s products are worth the money that you pay for them. In the ADA Cube Garden Review, we will look at how the ADA Cube Garden Stacks up. The great folks at Aquatic Plant Central have determined that my "Without Boundaries" layout is "The Tank of the Month." You can see the "Without Boundaries Tank of the Month" writeup here. Special thanks to Aaron from APC for his hard work. 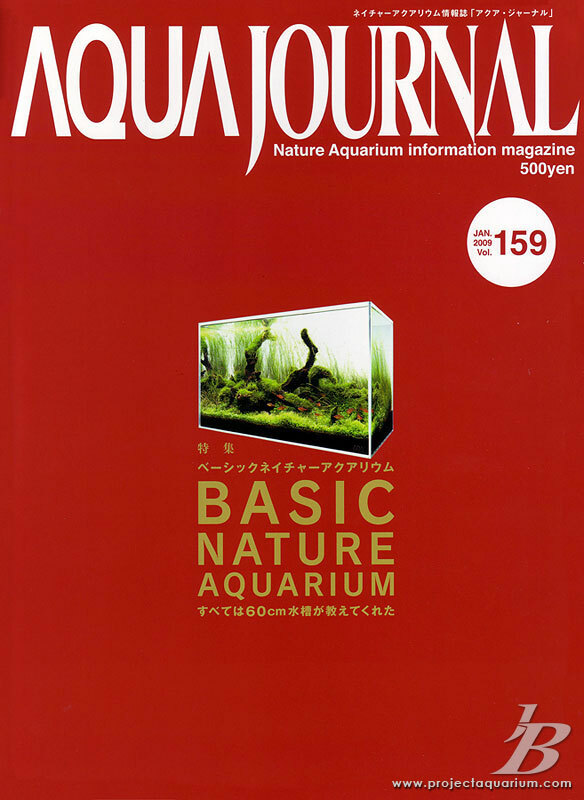 I wrote this article for Aquascaping World Magazine. I wanted to share it on my site as well. This will show you some tips on how to capture your layouts with a photograph that conveys our hard work, creativity, and skills. Check out Planted Aquarium Photography with a Point and Shoot Camera. I will be giving a workshop on Saturday evening, May 31st, 2008 at the monthly meeting of The Pittsburgh Area Planted Aquarium Societyin Pittsburgh PA. Admission is FREE!! I will be discussing aquascaping, nutrients, and other in depth topics. I added my latest layout "Without Boundaries" to the Gallery. This one turned out interesting considering that it was 1.5 years old at the time I took the pictures. The original layout idea was erased by nature withing 6 months. The final pictures you see are compliments of nature. 5/4/2008 - Your First Steps to a Successful Planted Aquarium!! I put together this tri-fold pamphlet that explains the basics on how to get started with planted aquariums. You can use this for your own club or give it to local fish stores to help educate other hobbyists about planted aquariums. Check out the article to download the Microsoft Publisher File. In Febraury, Kookaburra from Aquagora, a French Planted Aquarium forum, conducted an interview with me on my "Waiting" layout. The interview was conducted in English, but has been translated to French for their forum. You can read the original interview by clicking Interview with Aquagora - Le Bac De L'hiver 2007-8. I have updated my review of my ADA Layout Tools with some more honest information. I have been using the tools for over a year now, and I thought it was time to let you know how they have held up for me. I added an updated picture to the How to Build an ADA Style Aquarium Stand that shows what it looks like under my aquarium today. I will be giving a workshop on "Nutrients in the Planted Aquarium" at the Bucks County Aquarium Society Thursday evening, May 1st, 2008. Admission is FREE!! Special thanks to John Dinh for the super sweet Project Aquarium banner he designed for me!! 3/18/2008 - Welcome to Project Aquarium!! This is a new site!! I have worked at a fevered pace over the last two weeks to get this thing together. If you see anything that is spelled wrong or incorrect, please contact me.